Tens of thousands of Algerians have once again taken to the streets of the capital to demand that ailing President Abdelaziz Bouteflika quit immediately. 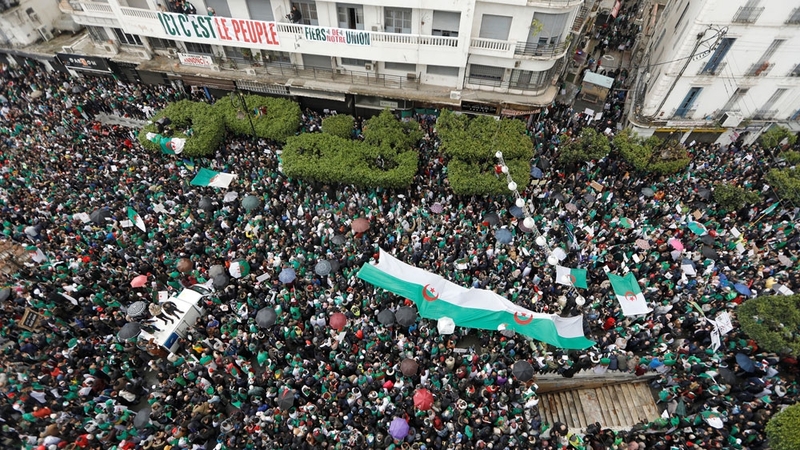 Carrying Algerian flags and chanting anti-Bouteflika slogans, protesters on Friday braved cold weather and light rain as they gathered in central Algiers, the site of weekly demonstrations since February 22. Amid growing pressure, Bouteflika on March 11 abandoned his bid to seek a fifth term at the helm of Algeria, a key petrol exporter. His promise to withdraw from the presidency sparked instant scenes of celebrations. But the protesters’ joy was short-lived as the president also announced that elections scheduled for April 18 would be postponed. He then declared his intention to preside over a transition period – moves that prompted critics to accuse the 82-year-old of attempting to prolong his 20-year rule. Noureddine Bedoui, who was named prime minister earlier this month, has since struggled to form a cabinet that has been tasked with managing the transition. According to the Maghreb Emergent news website, Bedoui has reached out to more than 300 people since his appointment. “They have called academics, trade unionists, civil society actors, doctors, journalists, lawyers, businessmen, artists and even a few activists from the popular movement,” a source close to the prime minister’s office was quoted as saying. This comes as analysts are noting a change of tone in the discourse of powerbrokers, including the country’s powerful military. After initially warning of looming chaos, chief of staff Lieutenant General Ahmed Gaed Salah on Wednesday expressed support for the “noble aims” of the youth-led protest movement. In recent days, members of the ruling National Liberation Front have also thrown their weight behind the protesters, in an apparent move by some members of Algeria’s old political guard to cut ties with Bouteflika, who has been confined to a wheelchair since suffering a debilitating stroke in 2013. A series of coordinated explosions has rocked. A series of bombings has hit. Millions of Egyptians are heading to. Gaza Strip – Under cover of. Police arrested a Florida man on. United States House Judiciary Chairman Jerrold Nadler. Mali‘s prime minister and his government. At least 205 people have been. A magnitude 6.1 earthquake has struck. US Attorney General William Barr has. The administration of Ethiopia‘s southeastern Somali. Indonesians have started voting to choose. Notre Dame Cathedral is one of. Two jailed reporters for the Reuters. Libya’s rival forces are intensifying their. New Delhi, India – In 2011,. Sudan‘s ruling military council has announced. Russia is back in the Central. Think you can survive in Bangkokâ€™s art world? Curate an art exhibition and survive. Sudan’s President Omar al-Bashir has been. More than 70 British members of. Democratic US mayors said on Friday. Algerian police tried but failed to. Organisers of the months-long demonstrations that. Washington, DC – US prosecutors have charged. Indians are voting in the first. US Treasury Secretary Steven Mnuchin said. Auckland, New Zealand – New Zealand’s. Israel Prime Minister Benjamin Netanyahu was. Asasabad, Kunar Province, Afghanistan – The. Hong Kong – A Hong Kong. Three US service members and a.